While Copy Number Variants are important to detect and interpret in many clinical genetic tests, labs have been without a comprehensive solution that integrates the annotating and reporting of high-quality CNV alongside their existing NGS variants. 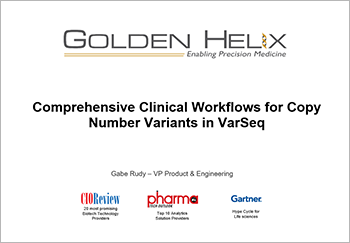 Golden Helix has developed and validated with our clinical partners a specialized NGS-based CNV caller capable of detecting deletion and duplication events as small as single-exons and as large as whole chromosome aneuploidy events. As this capability is applied to large panels and exomes with many putative CNVs per sample, it is important to distinguish between rare and common CNV regions as well as pull in clinical assessments done on similar CNVs that match the clinical phenotype under test. We hope you enjoy this as we review and demonstrate the comprehensive support for CNVs in VarSeq and the how these concepts apply to your clinical genetic tests.